Australian technology now boosting the performance of Germany’s flagship radio telescope will go on show at the Adelaide Convention Centre as part of the International Astronautical Congress 2017 from September 25 to 29. CSIRO designed and built the radio-receiving equipment for the 100m Effelsberg telescope near Bonn, the biggest single-dish telescope in Europe and one of the biggest in the world. The instrument, a 'phased-array feed', was originally created for CSIRO’s own Australian SKA Pathfinder telescope in Western Australia. "It's designed to speed up sky surveys by a factor of ten or more," Director of CSIRO Astronomy and Space Science, Dr Douglas Bock said. Effelsberg’s operator, the Max Planck Institute for Radio Astronomy (MPIfR), has received a customised version of the feed and will use it to hunt for superfast bursts of radio waves from the distant Universe. "The instrument is ideal for the science that we are doing and it is a perfect match – excellent technology for one of the world's best telescopes," MPIfR Director, Professor Michael Kramer said. Phased-array feeds might also be used to observe Earth from space and for other kinds of imaging. The Effelsberg-bound instrument was tested on CSIRO's Parkes telescope for six months before being shipped. Results of the tests, carried out by researchers based at the International Centre for Radio Astronomy Research (ICRAR), have now been accepted for publication in Publications of the Astronomical Society of Australia and are impressive. "We've shown this feed can detect one of the fundamental components of the Universe, atomic hydrogen, at much greater distances than is routinely possible," lead author and PhD candidate Tristan Reynolds of ICRAR and the ARC Centre of Excellence for All-sky Astrophysics (CAASTRO) said. The feed also helped counter the impact of radio interference – unwanted radio signals arising from human activities – and nearly eliminated an unwanted signal pattern caused by reflected radio waves that makes it hard to calibrate the telescope. "The feed removed 90 per cent of the problem we usually have from multiple reflections and further improvement is possible," Dr Bock said. CSIRO is developing another phased-array feed for Parkes, one cooled to low temperatures to increase its performance. Professor Lister Staveley-Smith of ICRAR’s University of Western Australia node, who leads the bid to fund it, said the technology was a "game-changing instrument for many kinds of astronomy". "One of the many things we want to study with this cooled feed is the annihilation of exotic matter around the centre of our Galaxy," he said. 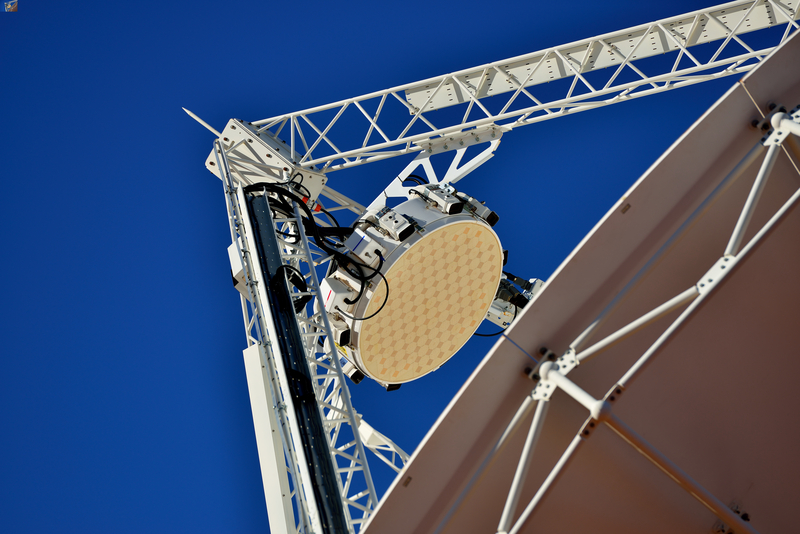 The CSIRO phased-array feed can be seen at the Australian Government stand at the International Astronautical Congress.